Product #7 | SKU 1010-027-100 | 5.0 (based on 1 rating) Thanks for your rating! Pelican 1010 Case for Small Devices - Ideal for fishing and rugged sports. 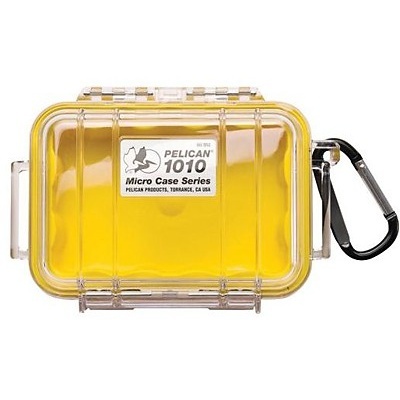 The Pelican 1010 Micro Case (Clear Yellow with Colored Lining) is made to protect valuable small items. They have the same look as larger Pelican cases. The case is watertight, crushproof and has a clear automatic pressure purge valve. The 1010 Clear Micro case has a matching and speed lock and liner. It includes a carabiner for easy attachment. A ring and a lanyard are included for easy attachment.